This isn’t even a remotely comprehensive chart. Image source. The result is that to westerners and other Abrahamists, Hinduism (when examined in more depth than a public school textbook) doesn’t really look very much like a religion. Not in the way they are used to. 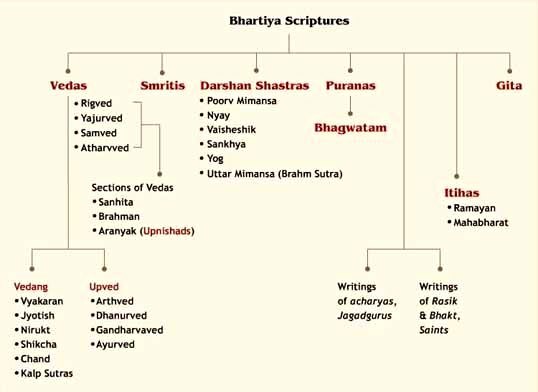 To them, it more resembles a very large school of philosophy insofar as it works with a shared basket of concepts, theories, ideas, and texts, but different subsections accept or reject different parts of them, and applies them in different ways often without “Vedic sanction”. I think there is an interesting way to illustrate this. 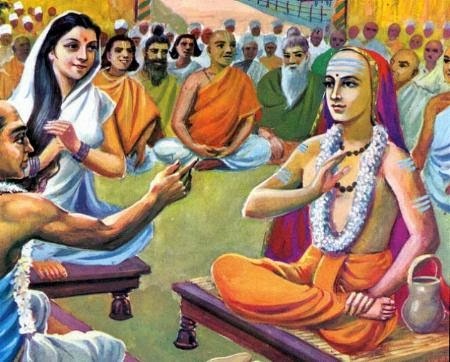 Lets compare two highly contrasting viewpoints within the tradition on three related subjects: Female independence, caste rigidity, and respect for Brahmins and the Vedas. First will be a set of quotes from Manu Smriti, the most well respected Brahminical legal authority, which was subsequently incorporated by the British into Anglo-Hindu law. Following that will be Bhakti (devotional) poems written in medieval India, by a highly “progressive,” community of poets and songwriters, the slight majority of whom were Sudras (the lowest, laboring and artisanal caste category) or Pariahs (outcastes, untouchables,) at least according to British census categories (the intricacies of British era caste categories are too complex to delve into here.) Obviously, as we will see, the idea of using the term “cafeteria Hindu” would be nonsensical, since adherence to any specific doctrine is not a criterion for membership in the community as a whole. “5.147. By a girl, by a young woman, or even by an aged one, nothing must be done independently, even in her own house. 5.150. She must always be cheerful, clever in (the management of her) household affairs, careful in cleaning her utensils, and economical in expenditure. 5.151. Him to whom her father may give her, or her brother with the father’s permission, she shall obey as long as he lives, and when he is dead, she must not insult (his memory). And I became the bride. 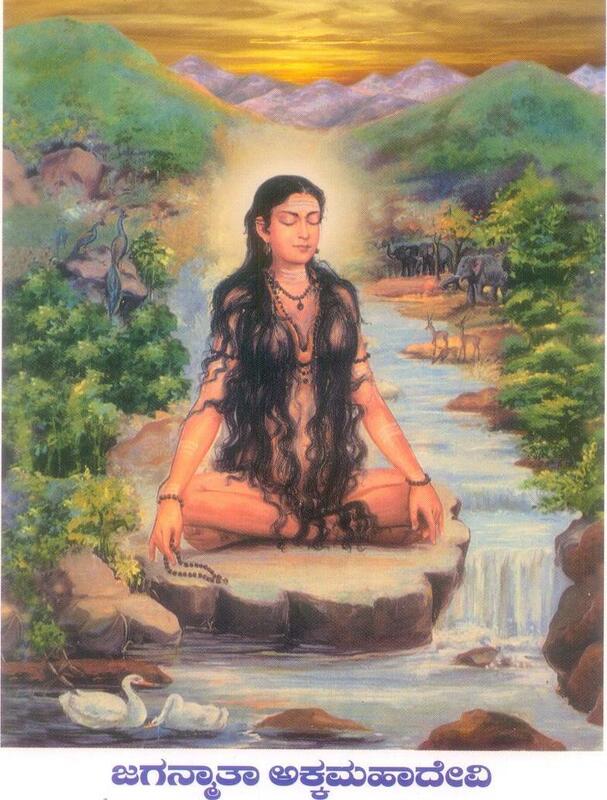 Akka Mahadevi in meditation. This is a characteristic portrayal of her. Image source. This is an inversion of Manu’s claim that a woman should treat the husband as God. She treats God as her husband. This poet was more than just talk. Akka Mahadevi refused to marry anyone, including a powerful monarch. She also refused to wear clothing on the basis that she was already wrapped in Shiva’s light. children and others may not approve. “1.91. One occupation only the lord prescribed to the Sudra, to serve meekly even these (other) three castes. 2.31. Let (the first part of) a Brahmana’s name (denote something) auspicious, a Kshatriya’s be connected with power, and a Vaisya’s with wealth, but a Sudra’s (express something) contemptible. 4.80. Let him not give to a Sudra advice, nor the remnants (of his meal), nor food offered to the gods; nor let him explain the sacred law (to such a man), nor impose (upon him) a penance. 4.81. For he who explains the sacred law (to a Sudra) or dictates to him a penance, will sink together with that (man) into the hell (called) Asamvrita. I daren’t accept a second man’s sir. Knowing you I will not. “9.334. But to serve Brahmanas (who are) learned in the Vedas, householders, and famous (for virtue) is the highest duty of a Sudra, which leads to beatitude. 11.56. Forgetting the Veda, reviling the Vedas, giving false evidence, slaying a friend, eating forbidden food, or (swallowing substances) unfit for food, are six (offences) equal to drinking Sura [extremely strong alcohol]. 12.31. The study of the Vedas, austerity, (the pursuit of) knowledge, purity, control over the organs, the performance of meritorious acts and meditation on the Soul, (are) the marks of the quality of Goodness. 12.48. Hermits, ascetics, Brahmanas, the crowds of the Vaimanika deities, the lunar mansions, and the Daityas (form) the first (and lowest rank of the) existences caused by Goodness. 12.49. Sacrificers, the sages, the gods, the Vedas, the heavenly lights, the years, the manes, and the Sadhyas (constitute) the second order of existences, caused by Goodness. 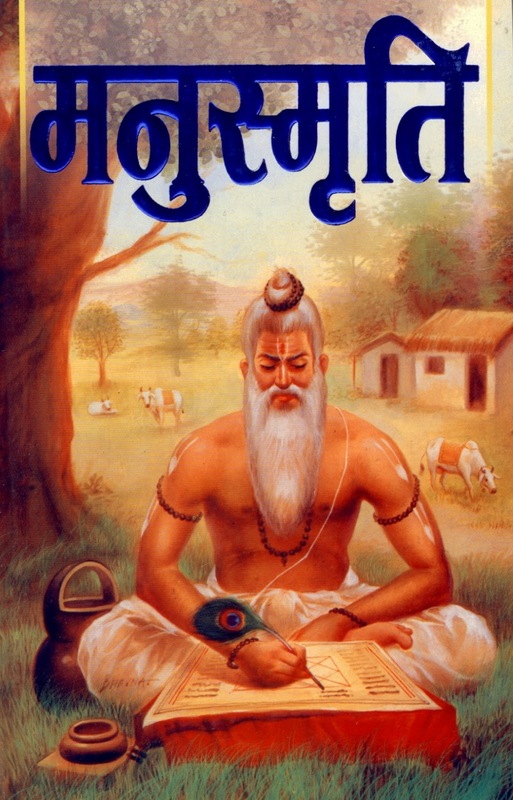 A modern copy of Manu Smriti, with Manu on the cover. The spitting image of Brahminical conservatism. Image source. Use your discretion to see truth, ye elders of Paichalur. Is caste and creed worthwhile, ye elders of Paichalur? Why then blame the paraya [outcaste], ye elders of Paichalur? But indistinguishable is the smell of the burning Brahmin. Does fire smell different if an unkempt Pulaya [low caste person] burns? Keep in mind, the latter group is not so heterodox as to be considered a separate community, like the Buddhists or Jains. They are definitively Hindu, and even are respected in most orthodox circles. Temples and statues are erected to them. Nor is the trend represented by the medieval poets fringe, or inconsequential to the history of Hinduism. It was thanks to them that at the popular level, Shaivite Hinduism overtook and all but displaced Jainism in South India. They also laid the intellectual groundwork for major colonial era reformers like Tarabai Shinde and the Savitribai and Jyotirao Phule. If you are interested in these poets, I have some more of their verses and some more discussion of them on my website. Ramaswamy, Vijaya. “Rebels — Conformists? Women Saints in Medieval South India.” Anthropos, Bd. 87, H. 1./3. (1992), p. 140.